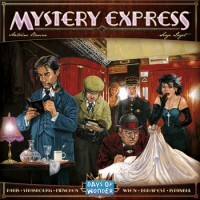 Mystery Express is a whodunit deduction game from Days of Wonder. The murder that takes place on the Orient Express incorporates 5 different elements represented by a set of Crime cards. Players take on the role of one of 5 traveling characters, each who has their own special powers of deduction. The player who figures out the who, what, when, where and why of the murder before the end of the journey wins. Designed by Antoine Bauza and Serge Laget, Mystery Express is an imaginative new take on the classic deduction board game, made up of top-notch components and unique, period-perfect illustrations. OK, maybe it’s a bit like Clue, but it is a little more complex, offering a step up for those who are all Clued out. The design is the same high quality Days of Wonder is known for. The game can be long, but given a few plays, I think it gets better once you have a feel for it. If you are not a deduction fan, don’t get this game. 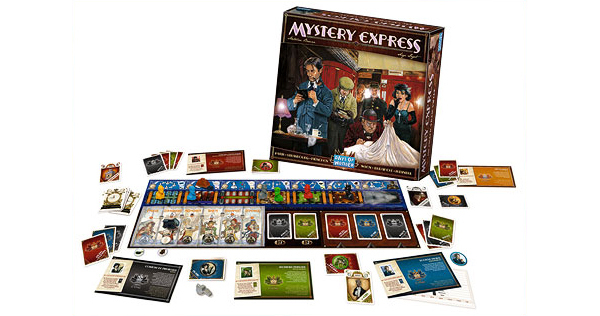 If you like deduction games, Mystery Express has a lot to offer with its multitude of deduction mechanisms. The game does use the Clue-like mechanic of peeking at other player’s cards. Other than the murder theme, this is the most similar connection to the classic mystery game. However, Express differs in that here are several different ways to view cards by selecting actions (putting your pawn in various cars of the train). This helps you to mitigate getting the same cards over and over, as well as trying to hide what you know from other players. Express’s use of “hours” to keep track of the rounds in the game is also unique. The game may end before anyone knows who the killer is. This adds a sense of urgency. Another nice twist is the conductor. He is placed in a different car every turn. If you are in that car on your turn, you get to pick up one of three cards on the board and replace it with a card of your choice. This gives you yet another way to eliminate options and gets cards out of your hand. Yet another mechanism is the time cards you look at 3 times during the game at certain “stops” along the way. This can be an important component to winning the game come score time. The cards are dealt out three different ways… just to make it that much more complex. New “passengers” also come on board at 2 specific “stops” with yet more cards to eliminate. These are important aspects of the game that make it intriguing. Finally, the telegram allows you to make a guess before the end of the game that gives you a chance to get a few more points. All in all, I enjoy this game more than Clue, because everyone gets a chance to figure things out or just make a wild guess. Points decide who wins, but you can also keep track of who comes in second if that’s important to you. This game will not be for everybody, as it can be frustrating… looking for that one card that cements your investigation. However, that’s what makes it fun for some of us. This game comes out every now and again. It’s not a game I play incessantly, but it scratches the deduction itch. I think the theme sets it apart from other games. It is well-executed. This game has some Clue-like elements but with much more. The best description I can give is that it is Clue, Mystery of the Abby, and Guess Who all wrapped up in one game with additional mechanics and a time element that make it even more exciting. It’s worth trying if you are thinking about it, and worth buying if you like mystery games. Days of Wonder did it again with this one regarding the fine componants and beautiful graphics. Another Clue knock-off, but minus anything fun or original. Frustrating and annoying, but at least the pieces are pretty. Add a Review for "Mystery Express"